signed and on verso signed, titled, dated 1935 and inscribed "To the Clarkes"
Each member of the Group of Seven had painting places in which they felt most empowered, and for Arthur Lismer that place was Georgian Bay. He spent many summers there, and in August of 1935 he was at McGregor Bay in Georgian Bay. Earlier that year, under the auspices of Eric Brown, director of the National Gallery of Canada, he had traveled west to visit provincial universities and to investigate art galleries and museums. Since Lismer was busy with his report, Dennis Reid records that "relatively few sketches survive from that summer." 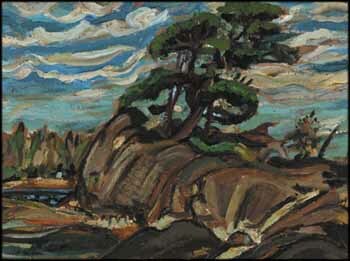 This rare work from that time is a classic Georgian Bay painting, in which iconic pines cling to sculpted rock formations. The atmosphere is fresh, as if a light breeze ruffles the bay, under a brilliant blue sky marked with thin clouds rushing along. This outstanding sketch bears a similarity to Lismer's 1933 canvas Pine Wrack, in the collection of the National Gallery of Canada. In 1935 collector Sir Frederick Clarke was appointed as adviser to oversea students at the Institute of Education, University of London, and in 1936 he became the institute's director.